Johann Wolfgang von Goethe’s Faust is an often cited parable about a man who trades his soul for power. Faust also is the tale of a nation oppressed by debt, the creation of fiat currency, and all that follows. Seven years of extreme monetary policy have not reduced total indebtedness, but simply transferred debt from financial institutions to governments. Worse, these heroic policies have fueled severe asset inflation without real economic growth. These policies have aggravated inequalities of wealth and income, thus viciously reinforcing their own inefficacy: whatever liquidity is generated ends up in the wallets of those with the lowest marginal propensity to consume. With central banks now wandering into the Wonderland of negative interest rates, it seems fitting to revisit an early (literary) case of helicopter money: Johann Wolfgang von Goethe’s Faust. There is no way these bills can be recaptured; they fled with lightning speed and are dispersed. The money changers’ shops are all wide open; there every note is honored and exchanged – at discount, to be sure – for gold and silver coin which soon gets to the butcher’s, baker’s and the dramshop; half the world seems obsessed with eating well, the other half with showing off new clothes. The drapers cut their cloth, the tailors sew. Wine flows in taverns where your Majesty is toasted as food is boiled and fried, and dishes make a clatter. Court Fool. I don’t quite understand these printed charms. Emperor. I don’t doubt that! You’ll never grasp their proper use. Court Fool. Some dropped; should I do anything about them? Emperor. They fell your way, so you may take them. Court Fool. Five thousand crowns! Is that what I am holding? Mephistopheles. Wineskin on legs, have you been resurrected? Court Fool. Many a time, but never with such profit. Mephistopheles. You’re sweating with excited happiness! Court Fool. Is what I’m showing you the same as money? Mephistopheles. It will supply your gut’s and gullet’s wants. Court Fool. And can I buy some land, a house, and cattle? Mephistopheles. Of course! Offer enough and they’ll be yours. Court Fool. A castle, too, with woods, a chase, and fishing? Mephistopheles. I’d give a lot to see you as a country squire! Court Fool. Tonight I’ll dream of my estates. Mephistopheles (solus). Who still can doubt our Fool has wit! 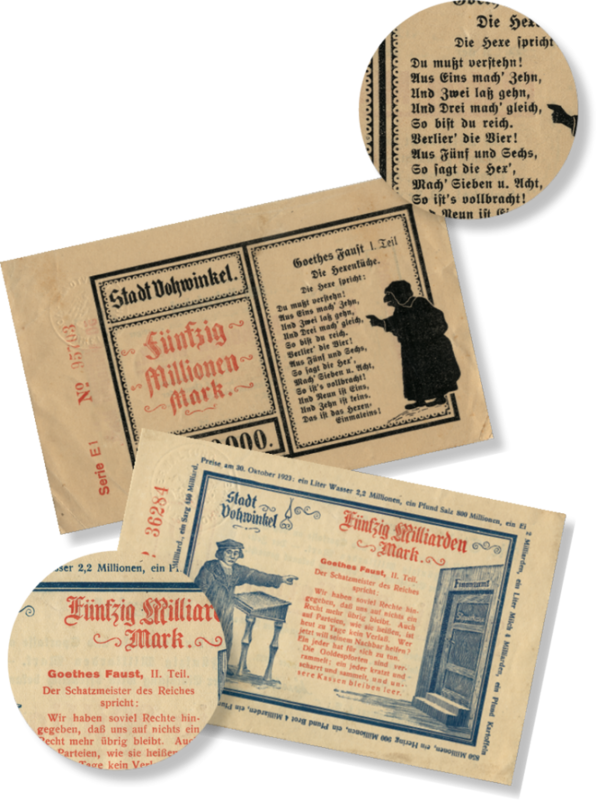 Germany printed trillions of marks in massive denominations. 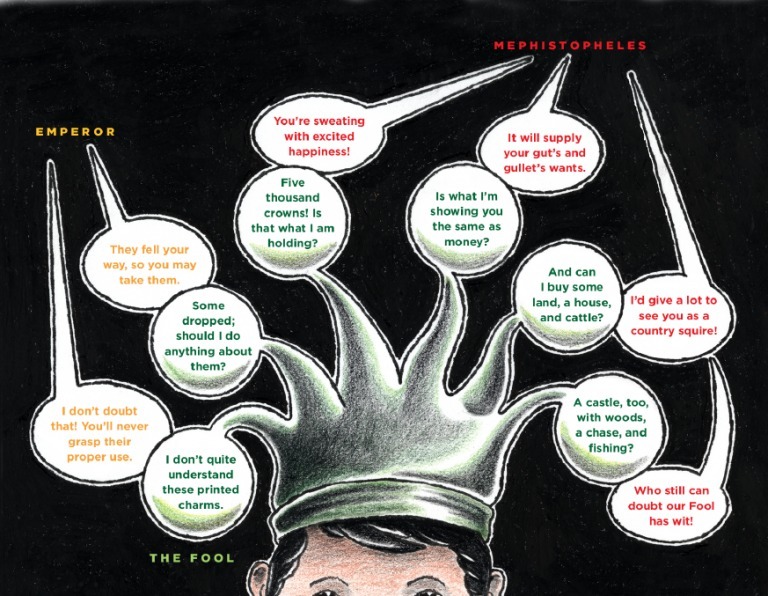 With a flash of literate humor, many of these (ultimately worthless) bills quoted from Faust. Often cited a parable about a man who trades his soul for power, Faust also is the tale of a nation oppressed by debt, the creation of fiat currency, and all that follows. To me, Faust (published in 1832) is the first post-industrial dystopian novel—and, as so, it is redolent of many of our current quandaries.